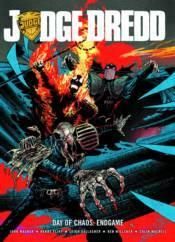 Mega-City One is at the mercy of a terrible act of retribution, thirty years in the making. The Chaos Bug has been released and a weakened Justice Department are finding it increasingly difficult to remain in control. As Judge Dredd searches for the perpetrators of this heinous act, another fearsome faction is added to the fray: Fear, Fire, and Mortis - the Dark Judges!